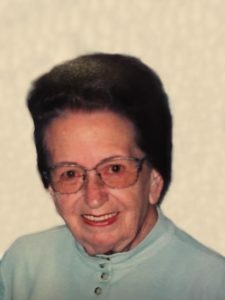 Leola S. Pillen, 85, of Schuyler, died Thursday, August 3, 2017, at the Schuyler Care and Rehabilitation Center. Memorial Mass Monday, August 7, 2017 10:30 A.M.
the American Cancer Society or donor's choice. Leola S. "Lee" Pillen was born October 17, 1931, in Platte Center to Leo and Mildred (Schroeder) Schilz. She attended Platte Center schools and graduated Valedictorian of her class from Platte Center High School. On October 24, 1950, she married Lester Pillen at St. Bonaventure's Catholic Church in Columbus. They lived on a farm near Monroe and in 1952 moved to Columbus. In 1967 they moved to Holdrege and returned to Columbus in 1973. In 1982, they bought land on the Platte River near Schuyler and in 1992, retired to Schuyler. Lee worked for GTE for over 26 years as the Customer Service Supervisor. While in Holdrege she was the Secretary of the Chamber of Commerce. Lee was very active in Divine Mercy Parish, having served on the Parish Council at St. Augustine's, assisted with funeral lunches and was instrumental in seeing the Social Hall at St. Augustine's become a reality. She and Les started CALIX, an Alcoholics Anonymous group for Catholics and sponsored many in recovery. Lee is survived by one daughter, Jonelle (Michael) Simon of Schuyler, two sons; Timothy (Jeannie) Pillen of Columbia, Missouri and Todd (Nancy) Pillen, Albuquerque, New Mexico, one brother, Raphael (Beverly) Schilz of New Philadelphia, Ohio, 13 grandchildren and a host of great-grandchildren. She was preceded in death by her parents, husband Les, son Jeffrey, daughter Janine Pillen, one brother Cyril Schilz and one sister Ann Clark.